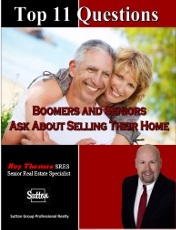 If you are like many of my clients you have lived in your current home for decades. It’s been a long time since you’ve sold a home. Perhaps this is the only home you have ever owned and you’ve never been thru the home selling process. It’s completely normal that you would be feeling some apprehension about the process and have lots of questions. You are not alone. Many of people I’ve help sell their home and transition to the next stage of their life have felt the same way. That’s why I wrote this eBook. What will I do if my house sells quickly and I haven’t found a new place to live? Can I sell my house in its current condition or will I need to have work done to it first? How much control do I have over the selling process? Once you’ve read this eBook you will have a clear understanding of the process and be better able to decide what the best next steps for you should be.